2. Cream debuted with a limited repertoire which led to free form jamming resulting in music that was exciting, frightening, creative and relevant. 3. Cream was the first band to improvise within the pop / rock / blues / jazz idioms and invented the “jam band” concept. Using songs from their albums as jumping off points, total improvisation made up the bulk of their performances. 4. Cream’s studio work has stood the test of time and songs like “Sunshine Of Your Love” and “White Room” are still radio staples, but their true influence lies in their innovative live sets. 5. Cream, made up of three virtuosos, redefined the instrumentalists’ role in rock. 6. Baker, Bruce and Clapton redefined the art of playing drums, electric bass and electric guitar. 7. 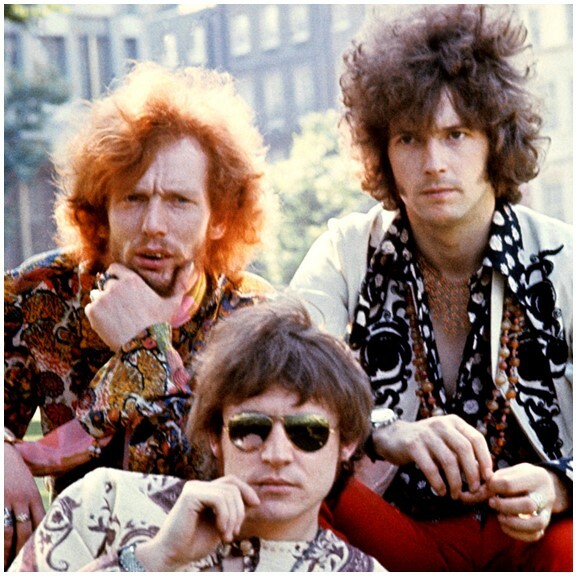 Cream was at the forefront of the psychedelic movement in music, art and fashion. 8. Eric Clapton and Jack Bruce were early adopters of Marshall Amplification so on the road their sound filled the largest venues. 9. Cream was the first band where the audience “felt” the volume. 10. Together for a little more than two years, Cream released four superb albums that are still influencing musicians today and causing young people to learn an instrument. 11. Cream was a contradiction. They were essentially one band in the studio and another one live (listen to the studio version of “Spoonful” on Fresh Cream vs. the live version on Wheels of Fire). 12. Eric Clapton wrote the primer on how to use a wah-wah pedal and pioneered the use of “Woman Tone” while in Cream. 13. Jack Bruce, working with poet Pete Brown, composed some of the most recognizable songs in the rock canon. 14. Cream moved music away from the lighter sound of 3 minute pop songs which paved the way for prog rock and heavy metal in the 70s. 15. Ginger Baker was not only the first drummer in a rock band to use double kick drums, he put drummers on equal footing with the rest of the band. 16. Cream was the first band to have an extended drum solo as part of the show. 17. Cream convinced sound engineers to record at full volume at the back of the room rather than keeping everyone inside the level meters. 18. The two record Wheels of Fire – one of the most diverse ever recorded – was the first double album to be certified gold. 19. Eric Clapton played the most iconic guitar solo ever on “Crossroads” (it’s on 1968’s Wheels of Fire). 20. Cream was one of the few bands to acknowledge and credit the blues artists who wrote the songs and made sure that originators got credit and royalties for their work, unlike some of their contemporaries.